Russia is the largest country with all its natural beauty. This is what attracts the interest of foreign tourists and becomes a pride for the Russian people. The beauty of nature in Russia is also well guarded by the government and the local community. So that a lot of Russian landscapes are included in the UNESCO world heritage list. one of them is Virgin Komi Forests. Virgin Komi Forests defines the greatness of Russia. These are aspens forest, run jungle plants, birch trees, peat swamps, natural lakes, majestic rivers and other features that might be associated with northern Europe. Virgin Komi Forests are plains and Mt. Tundra is truly amazing. Virgin komi forests are one of the remaining intact boreal forests in Europe. This taiga forest is located in The Ural Mountains, Republic Komi, Russia which stretches more than 300 kilometers along the northern and prepolar western slopes whose mountains have a large influence on the local temperature. Virgin Komi Forest has a million unique charms. There are 10 things you should know about virgin komi forests, Russia, which will certainly make you more interested in exploring Russia’s natural beauty. As we know, virgin komi forests are tundra and taiga forests that are overgrown with cypress and pine. The eastern region of the forest is dominated by the northern ural mountain. Characterized by the formation of glacier mountains. Beautiful pechora rivers and limestone along the foothills have formed a karst landscape with underground caves and craters. What a beautiful mix. Virgin Komi Forests is a taiga forest that is rich in tree species. Dominant tree species include the Siberian spruce, Siberia fir, and Siberia larch. Ground cover consists of cowberry and bilberry moss.This place is also home to more than 40 mammal species. The dominant mammals are deer, brown bears, ferrets, minks, squirrels, flying squirrels, foxes and rabbits. Endangered mammal species are wolves, beavers, wolverine, lynx, and sable. Besides mammals there are also 204 species of birds and 16 species of fish. The bird species that is quite famous is the Russian red book bird. In addition, there are also many grouse, black woodpeckers, bluetail, and capercaillie. A number of species of waterfowl, including golden eyes, goosander, wigeon, and bean goose that breed in the area. The most valuable fish species are Grayling Arctic, rare salmon and Siberian jellyfish. This wealth and diversity is due to the fertility of Virgin Komi Forests. Virgin Komi Forests lie wide on the pechora river that is very clear like a crystal. 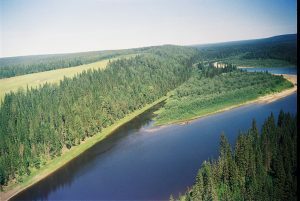 Pechora River is a river in the northwest of Russia that flows north to the arctic ocean on the western side of the archipelago. You can certainly imagine the combination of the beauty of Virgin Komi Forests and the crystal clear Pechora River. The lowlands of virgin komi forests are swamps. Boreal forests extend from swamps to the hills and bushes, grasslands, tundra and bedrock. Not only the taiga forest, Virgin Komi Forests also have very complicated and beautiful karst caves. The karst in this cave is truly amazing and is another sight of virgin komi forests. For those of you who like adventure, this cave at virgin komi forests is the most suitable place to channel your adventurous desires. There are several important archeological areas in the virgin komi forests. Researchers have found several sites in the paleolithic era, as well as ancient animal remains, including mammoths. In addition, fossil remains and ancient sanctuaries for the Mansi, Komi, and Pachera groups are also found. Aside from being one of the large intact boreal forests in Europe, virgin komi forest is also the largest virgin forest in Europe. Virgin komi forests have an area of ​​32,800 square kilometers with fertility and wealth. The most dominant mining item in virgin komi forests is gold which is now being threatened. There are still many irresponsible hands that explore gold in this region which can cause pollution in this protected area and also significant river pollution. But the government and the UNESCO party are incessantly making regulations to protect this world heritage from illegal activities. UNESCO’s reactive monitoring mission that staff management capacity is high location, relative to limited available resources. With this, it is expected that the local community and foreign tourists will want to jointly maintain the beauty and authenticity of the mini-style landscape. UNESCO established virgin komi forest as a world heritage in 1995, making the area of ​​virgin komi forest a protected area in Russia. This makes virgin komi forest increasingly famous for its beauty in foreign countries. In addition, this also keeps virgin komi forests protected from illegal mining and forest exploration which causes forest pollution and river pollution. So that the authenticity of this place is maintained like a world heritage. Russia is one of the countries that is a tourist destination for tourists who want to take a vacation and have an adventurous desire. One of their favorite places is virgin komi forest. Tourists will be guided by tour guides by traveling around pechora river by boat enjoying the beauty of Virgin Komi Forest. Enjoy the cool and fresh air, and enjoy the beauty of the crystal-like Pechora River. This really clears the fatigue of the mind all this time! No one is able to resist the charm of the amazing blend of Virgin Komi Forests and Pechore Rivers. Each region has its own uniqueness. And Russia is very lucky to have the beauty of virgin komi forests. As a world heritage, virgin komi forests must be maintained by beauty and authenticity. Because everyone has the right to see the beauty and geographic history presented there. Well, those are 10 things you should know about Virgin Komi Forests, Russia. And i’m sure you adore the beauty of that forests much more.